This Hungarian Goulash is a real comfort when the weather outside is frightening. For those of you surviving ‘polar vortexes’ and a steady diet of freezing temps, I suspect you too are striving to keep warm and comforting dishes on your dining table. 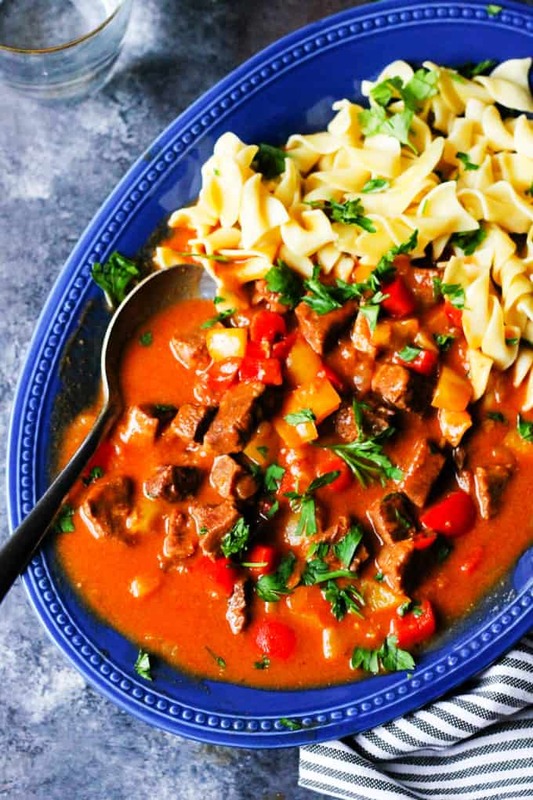 Super soft chunks of beef simmered in a tantalizing sauce full of the best Hungarian Paprika, a touch of tomato and caraway, finished off with a roux made from sour cream and flour, makes it for a very flavorful and hearty goulash. This recipe is made in Instant Pot, but don’t stress it if you don’t have one; you can find instructions below for the stove as well. If you like Hungarian Paprika and Hungarian dishes you may also want to check out my recipe for Hungarian Mushroom Soup. What is a Hungarian Goulash? 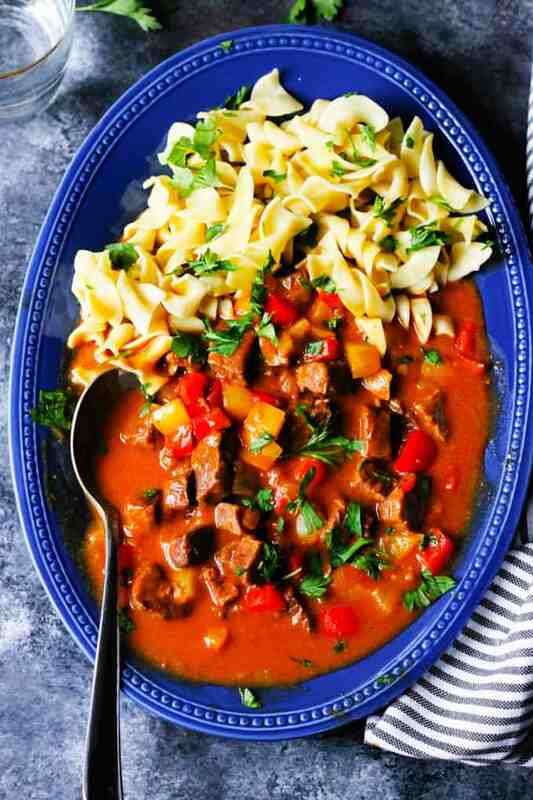 Hungarian Goulash is a meat stew, that contains chunks of beef sautéed with aromatics (like onions, garlic, caraway seeds, paprika and tomato paste) and then simmered in a beef broth based sauce. It’s then finished with fresh peppers and a roux made from sour cream and flour. The addition of fresh parsley when serving adds a freshness to this hearty dish. If you make this dish in the pressure cooker, then the simmering time will be much quicker then the stove. Below I will provide you with all the details for both methods. What makes Hungarian Goulash different from any other meat stew is the addition of Sweet Hungarian Paprika. And, mind you, you add a lot of it! But as you’ll see, the taste finishes out absolutely incredible. Another difference would be the way you cut your meat – the cubes should be smaller than regular beef stew (about 1/2 inch cubes). What Kind of Meat is Best for Hungarian Beef Goulash? In order to make goulash very flavorful, you’ll need to buy a cut of meat that is not very lean. You can ask your butcher for a good quality beef stew meat or simply search for a beef chuck. If you’re interested in organic beef you may want to check out ButcherBox (affiliate link). They take the legwork out of hunting for a good cut of meat by delivering it directly to your door. I’ve found that they always have good promotions running too (if you decide to sign up with them make sure to take advantage of the freebie). What Kind of Paprika is Best for Authentic Hungarian Goulash? 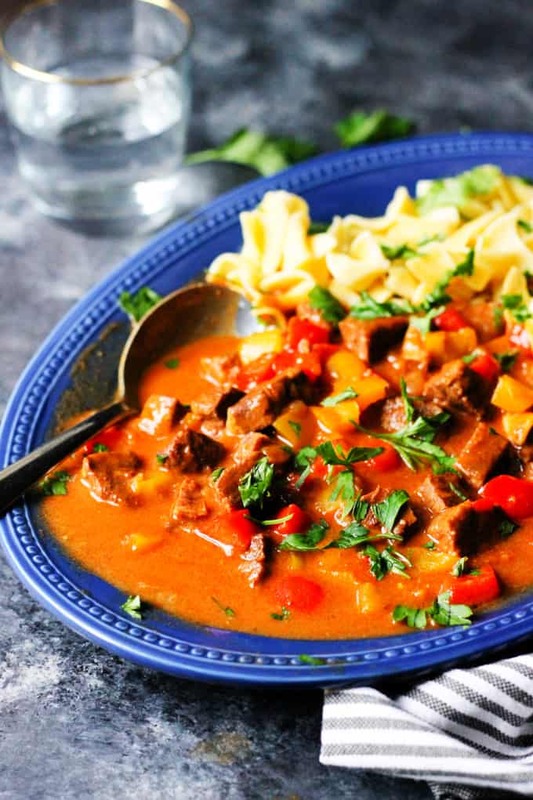 Here’s where this goulash differs from all the other meat stews….the addition of Authentic Hungarian Sweet Paprika. The difference between Hungarian sweet paprika and your regular paprika is in the depth of flavor. Hungarians really take pride in the tastes of their paprika. Sweet Hungarian Paprika (affiliate link) is not actually sweet. Frankly, I believe the ‘sweet’ descriptor was just intended to contrast Hot Hungarian Paprika (affiliate link) (ie, if not ‘Hot’ then ‘Sweet’). And by the way, if you want this goulash to be a little spicier, then feel free to add some Hot Hungarian Paprika as well (my hubby requested that extra kick, but my kids would’ve rejected it that way). 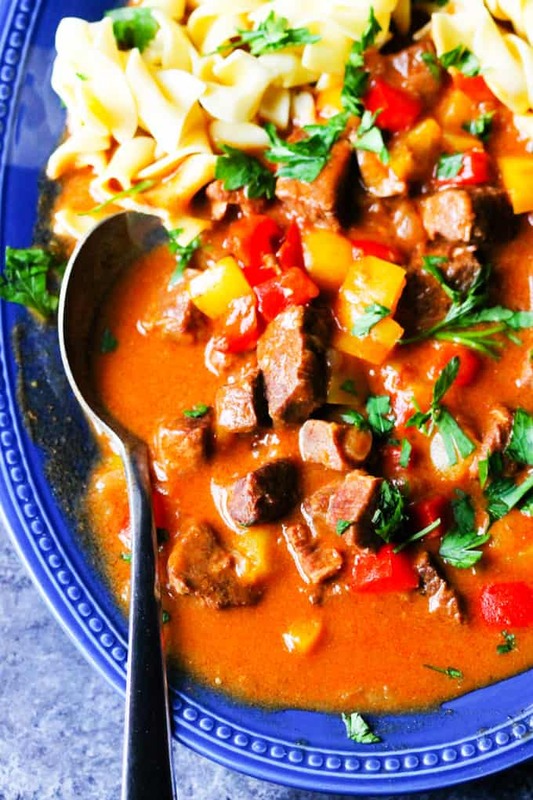 Can you freeze Hungarian Goulash? Yes! 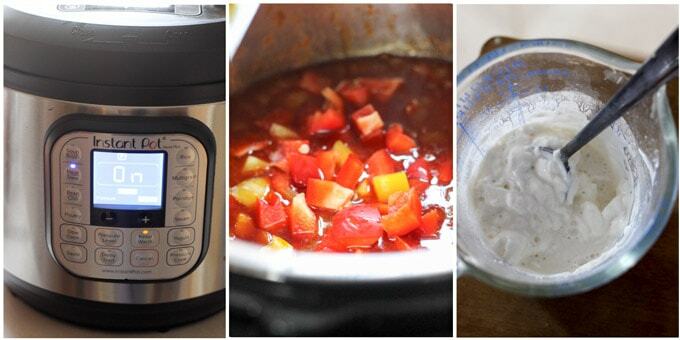 You can freeze Hungarian Goulash. That’s really the beauty of it. You can make a big batch and store half of it for another dinner. Place it in an airtight container and freeze. You should, however, use it within 3 months from freezing. When defrosting, run the container under hot water until the goulash releases from the sides of the container. 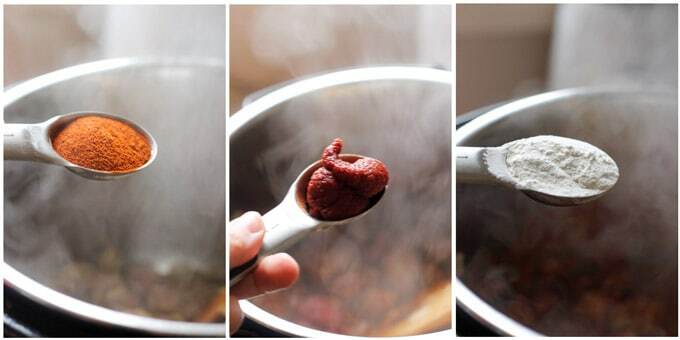 Transfer goulash into a deep pan, or braising pot (affiliate link), with a half a cup of water and let defrost, and then cook until it starts bubbling. What Ingredients are needed to Make Hungarian Goulash? How to Make Hungarian Goulash in an Instant Pot (Pressure Cooker)? Ever since I purchased my Instant Pot (affiliate link) and tried my own recipe for Short Ribs (except in my pressure cooker), I don’t want to cook tough cuts of meat any other way. The meat comes out so tender that it literally falls apart. I’ve never achieved this kind of tenderness cooking the meat on the stove. Hence, this recipe for Hungarian Goulash is intended for an Instant Pot. In the next paragraph as well as in the recipe notes you can find instructions for the stove – but be aware, your meat will not be as tender. Step 1: Set your Instant Pot on the sauté setting. Once it’s warmed up, add butter and onions, then sauté the onions for about 5 minutes (until translucent and soft). 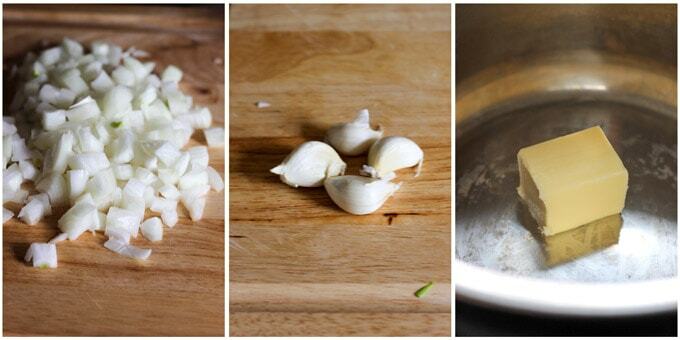 Add garlic and cook for another minute. Step 2: In the meantime, cut up your beef into small cubes. Add them to the Instant Pot and sauté for about 10 minutes. Step 3: Add paprika, flour, tomato paste, and caraway seeds. Mix it all up (tip: you don’t want paprika to cook and burn, it will become bitter). Step 4: Add the broth, cover and set pressure-cooker for 20 minutes on high. Once the 20 minutes is done and your pressure cooker goes into a warm mode, do not release the pressure! Let it depressurize naturally. If you release the pressure the meat can toughen up and will not be this tender. It may take some time, between 20 to 40 minutes before all the pressure gets released. But the wait is well worth it. Step 5: Once your pressure has released, open up the Instant Pot and add chopped peppers. Set the setting back to sauté and cook the goulash with peppers for another 10-15 minutes, until peppers are soft. Check for seasoning and adjust with salt and pepper. Step 6: In the meantime prepare the roux: Mix 1 tablespoon of flour with sour cream and a splash of water, mix well until thoroughly combined (ie, no lumps). Once your goulash is all cooked you will temper the roux. You will add half a ladle (affiliate link) of hot stew liquid to the roux and mix well. You will continue adding the hot liquid until you have a full cup filled, then you will pour it into the goulash and mix well. Let cook for a minute, to thicken up. Then serve with a sprinkle of fresh parsley. 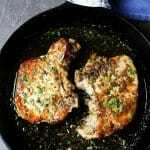 For the stove top version, use a Dutch Oven (affiliate link) or other heavy saute pan. Heat it up and follow the steps 1-3 above. Then add the broth, cover and cook for about 1.5 hrs (until the meat is tender). Finally, follow step 6 above. Hungarian Goulash would often be served with the Hungarian version of Spaetzle, which is called Nokedli – these are simple homemade noodles. But, you can also serve them the way I did here, with egg noodles. Other options would be mashed potatoes or rice. As a side dish, I would suggest a cucumber salad. It’s very refreshing and tones down the richness of the goulash. If you make this awesome Hungarian Goulash then please let me know in the comments below how you liked it and tag me @eatingeuropan on Instagram. Cheers! 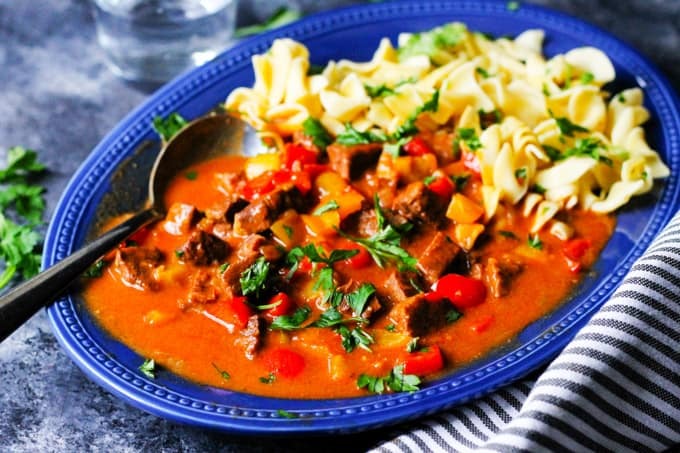 Super soft chunks of beef simmered in a tantalizing sauce full of the best Hungarian Paprika, a touch of tomato and caraway, finished off with a roux made from sour cream and flour, makes it for a very flavorful and hearty goulash. 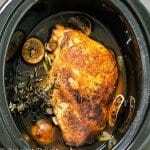 This recipe is made in Instant Pot, but don't stress it if you don't have one; you can find instructions in the recipe notes for the stove as well. Set your Instant Pot on the sauté setting. Once it's warmed up, add butter and onions, then sauté the onions for about 5 minutes (until translucent and soft). Add garlic and cook for another minute. 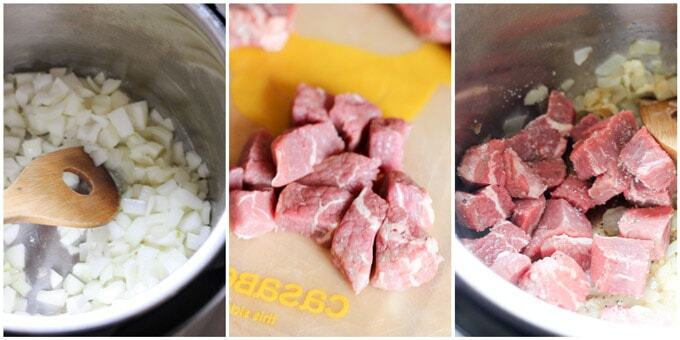 In the meantime, cut up your beef into small cubes. Add them to the Instant Pot and sauté for about 10 minutes. Add paprika, flour, tomato paste, and caraway seeds. Mix it all up (tip: you don't want paprika to cook and burn, it will become bitter). Add the broth, cover and set pressure-cooker for 20 minutes on high. Once the 20 minutes is done and your pressure cooker goes into a warm mode, do not release the pressure! Let it depressurize naturally. If you release the pressure the meat can toughen up and will not be this tender. It may take some time, between 20 to 40 minutes before all the pressure gets released. But the wait is well worth it. Once your pressure has released, open up the Instant Pot and add chopped peppers. Set the setting back to sauté and cook the goulash with peppers for another 10-15 minutes, until peppers are soft. Check for seasoning and adjust with salt and pepper. In the meantime prepare the roux: Mix 1 tablespoon of flour with sour cream and a splash of water, mix well until thoroughly combined (ie, no lumps). Once your goulash is all cooked you will temper the roux. You will add half a ladle of hot stew liquid to the roux and mix well. You will continue adding the hot liquid until you have a full cup filled, then you will pour it into the goulash and mix well. Let cook for a minute, to thicken up. Then serve with a sprinkle of fresh parsley. In a dutch oven or other heavy deep pan add butter and onions, then sauté the onions for about 5 minutes (until translucent and soft). Add garlic and cook for another minute. In the meantime, cut up your beef into small cubes. Add them to the pot and sauté for about 10 minutes. Add chopped peppers, cover and cook for another 10-15 minutes, until peppers are soft. Check for seasoning and adjust with salt and pepper. This looks like such a comforting meal! I can’t wait to make it for my family! My great grandparents are from that area of the world. Unfortunately, they didn’t pass down many of their recipes. I would be anxious to try this just to get a taste of my heritage. Thank you for including an Instant Pot option. I use mine all the time because of the convenience. This looks like a hearty dish that my whole family will love. Oh yes! I love my Instant Pot too. And this dish is outstanding cooked in it. This looks incredible! 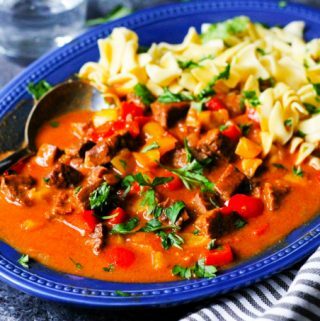 I’ve never made Hungarian Goulash before-I definitely want to try this, especially the Instant Pot version. Yum! Wow! I love all your tips!! 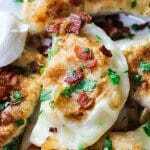 My family would love this dish, and I love using my Instant Pot, and finding new recipes to try in it. We’re in the middle of a white-out blizzard, and this is totally calling my name right now. Goulash is something that my whole family loves. I never tried making it in instant pot. Sounds super easy. I must give this recipe a try. Love the addition of Caraway seeds.